It's been a long time since I have been blogging and so I will ease back into a very missed part of my life-blogging. I will share my trip east with several blog posts as there is a lot to share! Plans for the trip started last January when LaVonne came to visit me. 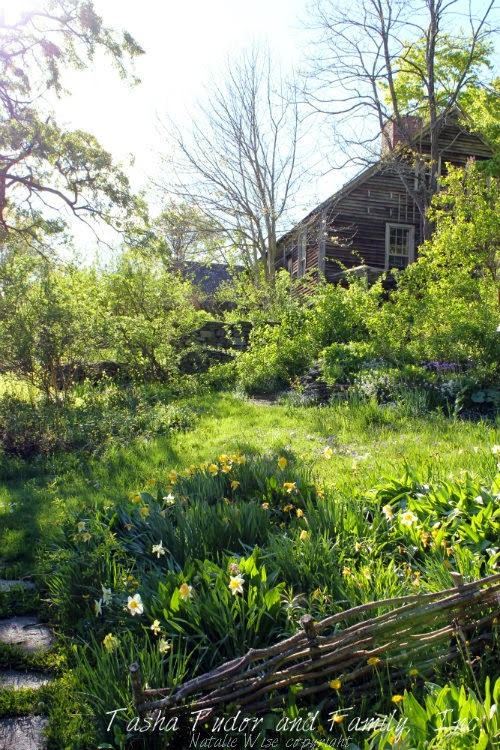 I had read in the Tasha Tudor and Family newsletter, that tickets for the garden tour this year would include a visit inside Tasha's home as the dollhouse was just being moved back from being on display in Williamsburg. The family was very excited to have it back on the property. LaVonne was so busy getting ready for her trip to Oregon that she had missed all of this information. Our friend Kristen had told her she was going to get a ticket and go in May by herself. When LaVonne and I started to discuss all of this, our hearts started beating and we thought it would be really neat if we could go! We began looking at airline tickets and oh, they were so expensive. We had to move quickly, as limited tickets were going to go on sale January 28th for the tour. We found affordable tickets and LaVonne emailed Amy Tudor to see if our Tasha group could have a private tour as we had done seven years ago. She agreed! LaVonne and I were in Poulsbo WA visiting friends when all of this happened! When we got back to Portland and I took her over to her daughter Julianna's home, she helped us get coordinating airline tickets! This is the picture when the tickets were purchased! The trip we had waited for was finally going to happen once again....Vermont, here we come. 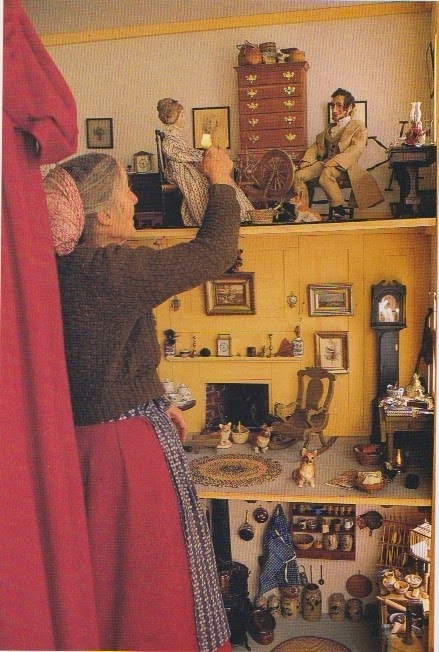 These are some pictures from the Tasha Tudor and Family website to give you an idea of the property and the dollhouse. So for months, plans were made from afar and the excitement was almost too much by the time May 13th arrived. I had a very early flight and I had to get up at 2:30 am. When I got out of the shower, I had received a text message that my flight had been cancelled due to weather! I had been checking the weather reports and I just couldn't believe it. It said to go to the airport and see a ticket agent. I was supposed to meet LaVonne in Chicago around noon when she arrived there from Montana. I called her to tell her the bad news. Her flight didn't leave until later, so she didn't know what was ahead for her. Jim waited in line with me at PDX for 3 hours! Here's a picture of the very LONG LINE! I was getting concerned that I would miss the garden tour as it was the next morning at 9 am. They were sending me onto Seattle, then Chicago and then on to New Hampshire. My hopes soared and I was soon on my way to the Emerald City. Then the trouble began once again. Delays, delays, delays....on the airplane, off the airplane. I met some very nice people who made this part of the journey bearable. Brianna from MA and John the writer from NC were just so much fun! We finally got to O'Hare. There was also a smoke fire in the control tower in Chicago and we were never told. We got into the midwest too late for any planes to take off. There were just 1000's of people stranded with no hotels available! We were told to see a ticket agent once again. Oh, that line was longer that the Portland line! 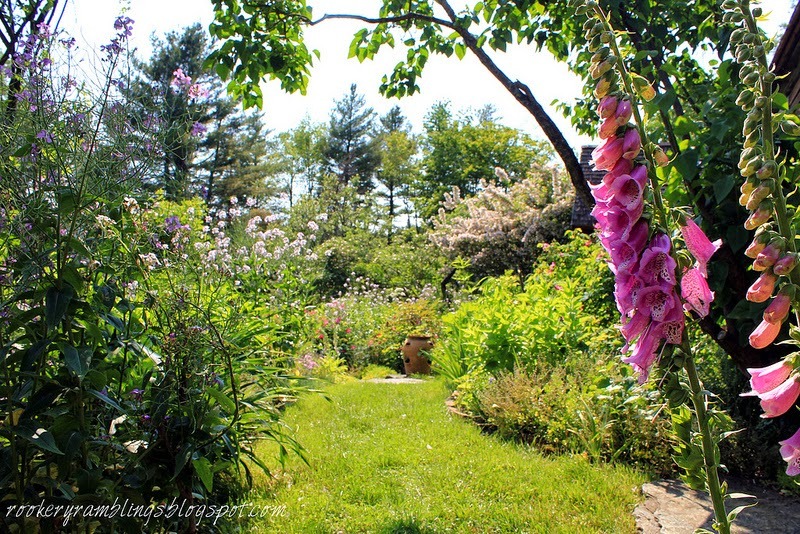 I was so sad, as I had knew I was going to miss the garden tour. LaVonne was lucky as she had finally reached NH after changes in plans and airports. A nice lady, Mary from Seattle, took me over to a shorter line and I got a seat on a flight out the next day at 2 pm. After I got my ticket, we found a place to sleep where they had some cots. Sleep, did I say sleep? I couldn't sleep all night. I was texting with my Gina and my friend Natalie. They kind of got me through the night. I felt like I was in a nightmare! Here's a picture of the cot area. I left the area at 3:30 am as the airport was beginning to come to life. I was bored to death, waiting for that 2 pm flight. Kristen's husband would be able to pick me up in NH and drive me to the hotel in VT. I would be missing the tour. This is a picture of my friends who went on the tour. It's Brian's picture, so thanks Brian! I didn't get to meet him or Patricia. I got a text from LaVonne that the Tudor family would give me a private tour! I wouldn't miss the chance to see Tasha's home and the dollhouse after all. That made me so happy. I was sad to miss the chance to share this with my friends but thankful! You are not allowed to take any pictures while on the tour, but you can take photos in front of the Rookery. They all had their dolls and Brian brought this lovely turkey red tablecloth for the photo shoot. Again, this is Brian's picture. So my poor Annabelle missed out on this too. One of the things I had planned was a tea at the hotel for my friends. I had sent items ahead and was going to set it up after lunch. Those plans went out the window too. My sweet friends unpacked all my goodies, went to the store and bought the fruit, cheese and flowers and set it all up for me! When I arrived at the hotel, LaVonne, Kristen, Melinda and Wilhelmina came running out screaming and yelling and hugging. It was great! After I got to my room, I just wanted a shower!!! They even waited for our bottle doll class. Suzanne and Cat were waiting in the room when I got done with my shower. 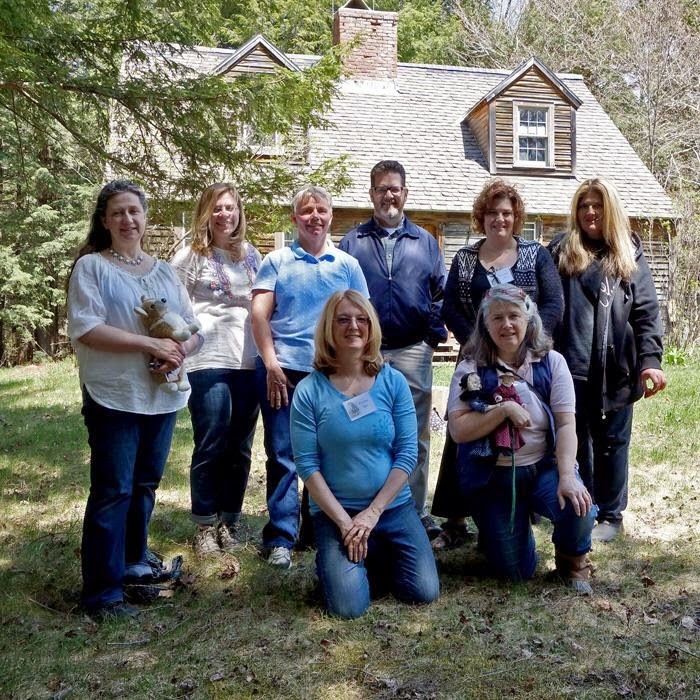 All of us had met seven years ago on our first Kindred Spirits Gathering. 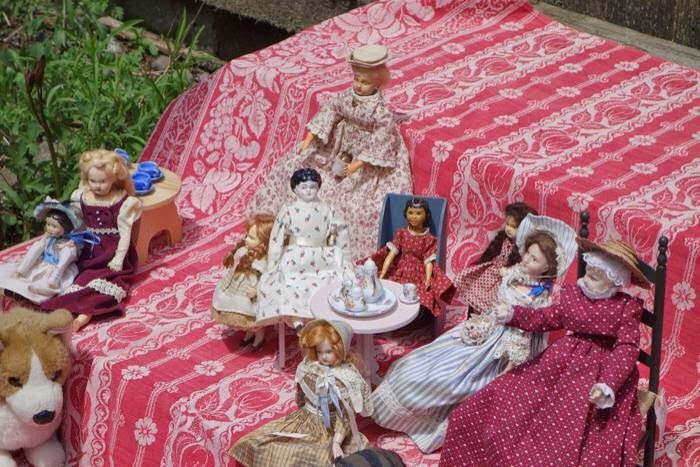 Of course the dollies were there with all their little tea sets too. Kristen had started an A is for Annabelle doll club years ago. Most of us have made our little Annabelles. They are only 10 1/2 inches tall. Of course, we had some other little ladies visiting there too. This is my Annabelle...poor thing was in my backpack through the whole airport disaster. I was afraid she might have gotten broken, but she was just fine! It was time for tea and treats! Lots of goodies for us all and for the dollies. So fun. LaVonne brought her darling little picnic set that once belonged to Tasha. It is adorable and just the neatest treasure. We all brought a tea cup for tea time and then we had a tea cup exchange. We were all getting tired. Tea time treats, corgi cut out cookies and lots of yummy goodies to share and eat. This is the only photo I got of the gang (minus me)....LaVonne, Melinda, Kristen, Wilhelmina, Suzanne and Cat. After tea, we started our bottle doll class. LaVonne and I had made these up in Poulsbo last January with our Tasha friends. It's a fun project using glass shakers and ceramic half dolls or even just the doll heads. It's fun to see what everyone comes up with...a creative project! I think we were just all so tired and we sort of faded out. I was soooo happy to go to bed and sleep. An update on Jimmy. He has been to the doctor 3 times and his ears are still plugged. This has been going on for 5 weeks now, poor guy. One more week and he has to see the ear doctor. I had my cough most of the time I was on my trip. I was getting better and came down with something when I got home. I am finally over it all. My poor Jimmy is really sick. I have picked up the cough and cold. Lots of our family is sick too-sigh. So much for catching up on the blog. Kleenex, water, cough and cold meds and rest.